I wonder if the other sewing machine companies attach pockets with velcro to their promotional items. The pockets are made this way so they are easy to remove for machine embroidery. The bag was given to all the participants at the embroidery class I took on Saturday, and the CD case was part of a ticket drawing. 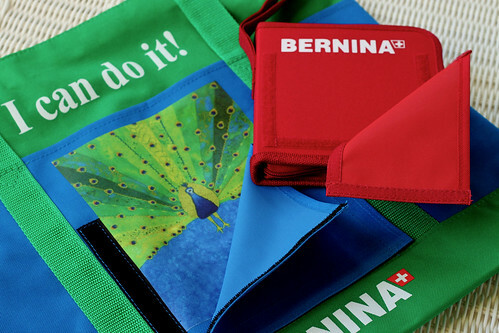 Everyone’s ticket was eventually awarded something Bernina. Besides learning different techniques for machine embroidery, the class had a party like atmosphere. I can see why these classes are so popular and am looking forward to taking more of them. My machine will not be here until Monday. It is going to be a long week. This entry was posted on Wednesday, October 21st, 2009 at 3:00 am and is filed under Bernina 830 and Sewing. Tagged: Embroidery, Sewing. You can feed this entry. You can leave a response, or trackback from your own site. I hope you have all day Monday to play!